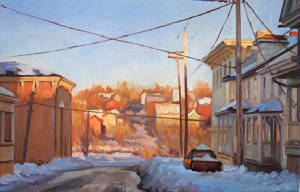 "His mastery of oil painting can be seen in almost any genre - landscapes, street scenes, still lifes, and portraits. He captures light and color in a manner that is both naturalistic and ethereal. Eschewing post-modern theories of conceptual art, he focuses on the formalistic concerns of light, shadow, form, color and texture. Never overworked or fussy, his paintings capture an atmosheric mood which elevates them from mere reporting of physical presence."